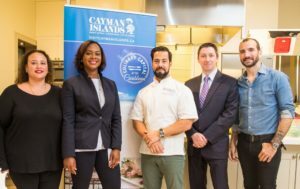 The Cayman Islands Department of Tourism launched its destination Culinary Guide last week with an intimate cooking and mixology demonstration in the private event space at the LCBO Summerhill in Toronto. In celebration of the launch, Cayman culinary all-stars chef Massimo De Francesa of Kimpton Seafire Resort + Spa, and James Beard Award-winning master mixologist Charles Joly prepared a menu of Caymanian dishes and cocktails representing the destination’s world class epicurean offerings. From left to right: Ruth Myles, PR Manager, Cayman Islands Department of Tourism; Oneisha Richards, Deputy Director International Marketing and Promotion, Cayman Islands Department of Tourism; Executive Chef Massimo De Francesca of Kimpton Seafire Resort + Spa; Raymond Mathias, Business Development Manager – Canada, Cayman Islands Department of Tourism; and Master Mixologist, Charles Joly. The Cayman Culinary Guide was developed to give travellers and planners insight into how to best explore and experience the tiny trio of islands offering of more than 200 restaurants and myriad gourmet delicacies. Visitors can now reference the guide to learn about native ingredients and cuisine, local food events such as Restaurant Month and Cocktail Week, top restaurant picks from notable Canadian chefs, recommended epicurean attractions, recipes, not to be missed restaurants (it is home to the Caribbean’s only AAA Five Diamond restaurant) and farmers’ markets and much more. The event kicked off with a Caymankind welcome to invited guests and an introduction to the Cayman Culinary Guide. Chef Massimo De Francesa and Charles Joly then hosted an interactive program in which they prepared modern Caymanian dishes and cocktails showcasing traditional ingredients. The menu included highlights such as a “Seven Mile” smoked ahi crudo with citrus and Cayman sea salt, Caribbean snapper filet accentuated with star fruit relish and guava glaze. For dessert, guests enjoyed a delightful vegan coconut panna cotta with toasted white chocolate and mango gel. Cocktails included Cayman twists on the classic daiquiri and old fashioned with Caribbean flavours such as grapefruit and papaya.